What Causes Wrist Pain When Playing Baseball? Nicholas Bragg, a lifelong athlete and certified personal trainer, attended four separate colleges from Maryland to California, finishing in 2004. Named to the CEO's club as an elite performer at Intuit in 2009, he changed careers in 2010 and now contributes writing to Mahalo and SportswithM. Wrist pain is among the most common sports related injuries. In baseball, the wrists are constantly torqued in all different directions, sometimes unnaturally. The severity of the injury that causes your wrist pain can vary significantly. Before you attempt any form of advanced home treatment, make an appointment to see your primary care physician for a thorough inspection and proper diagnosis. Wrist pain from baseball can come from any number of movements. Mild pain often comes from improperly following through when swinging a bat. This usually happens when the momentum of the bat on the back end of a swing torques your wrist in an unnatural position. Another baseball movement that can cause wrist pain is sliding into a base and jamming your wrist on the bag itself. This movement, along with any other impact movement using your hand as a brace to stop movement, typically results in more serious wrist injuries. 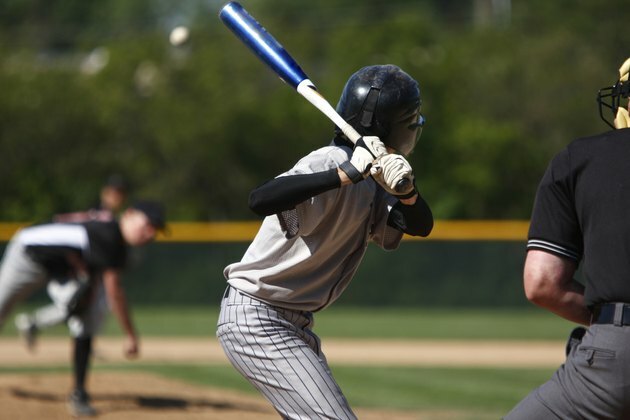 Wrist pain from swinging a bat can range from a mild level one sprain that can be taped up or wrapped with a bandage and played through with minimal pain, to something as serious as a severe sprain in which multiple tendons have ruptured. Pain stemming from an impact movement can be as mild as a bruise, or as severe as multiple broken bones that require a cast and several months of rehabilitation. Wrist pain in baseball generally is accompanied by swelling and lack of mobility. Immediately upon feeling the pain in your wrist, you should stop whatever you're doing and rest the joint. Place a bag of ice onto the affected area with a cloth barrier between your skin and the ice, and keep it there for 15 to 20 minutes. Repeat this every two to three hours to reduce swelling. Wrap the wrist with a cloth or elastic bandage for 48 hours and elevate it to a height above your heart. Unlike most other sports, wrapping or taping a wrist for support is not an option in baseball, as you'll require the full range of motion in your wrist to play at even the most basic level. You can however, practice your swing follow through at all angles, swinging at high, middle, and low pitches, all while releasing the bat post-swing with minimal strain on your wrist. Headfirst slides are always optional and are rarely recommended; thus, switching to feet-first slides is the best preventative measure you can take against impact injuries. SportsMD: What is a Sprained Wrist?